Well, then. Now that almost 48 full hours have passed and all of us have likely caught our breath, we can examine more clearly and coherently then Patriots stirring, improbable, 23-20 win over the Baltimore Ravens in the AFC Championship. The win, which sends the Pats to their seventh Super Bowl and fifth under the magical tandem of Bill Belichick and Tom Brady (the most of any QB/coach combo of all time), was maddening, scintillating, ugly, glorious and completely perplexing, sometimes all at once. The Pats won with defense and physicality and if you had that one down headed into the game, I’ve got some lottery numbers for you to play (I’ll throw in a healthy commission for your trouble), with Brady playing one of his worst games of the season and the team losing three turnovers but somehow getting away with it. Multiple defensive guys had huge days and when you take that, some strong, powerful running by the Law Firm of BenJarvus Green-Ellis, more of the same mental toughness this team has shown all year and at least a spoonful of luck (fear not, we’ll get to the missed, 32-yard field goal, also known as the biggest gag job I’ve ever seen), it all adds up to a trip to the big game 12 days from now in Indianapolis. So with that, let’s get to this week’s report card, all dressed up and ready for the dance. Before we go any further, let’s get this out of the way: Brady is as tough, if not tougher than any QB in the NFL. On his fourth quarter, one-yard TD plunge, he was upside down in midair when he was blasted in the kidneys and lower back by the helmet and shoulder pads of none other than Ravens all-time linebacker Ray Lewis. And not only did he hold on to the ball, securing the points that would prove to be the difference in the game, he got right up, spiked the ball Gronk-styles and jogged to the sideline. It hurt just watching that play but if Brady was affected, no one either in Gillette Stadium or watching the game on TV knew it. Now, bearing that in mind, Brady pretty much sucked otherwise, just as he said on the podium after the game. He routinely missed open receivers. He was skittish and happy footed at times. He threw two interceptions and had two other ones nullified by penalties. His fourth quarter pick, one play after Brandon Spikes made one of the plays of the game, on which he needlessly forced a bomb into double coverage (intended for Matthew Slater of all people) was something you would never in your wildest dreams imagine seeing him do let alone in the fourth quarter of the AFC Championship with a three-point lead. He finished 22-of-36 for 239 yards (6.6 YPA), zero TDs (the first time that’s happened in the playoffs since the 2002 AFC Championship game in Pittsburgh) and the two picks, all good for a woeful 57.5 passer rating. He was outplayed by Ravens QB Joe Flacco (??!!). But hey, the Pats won and if we know Brady,, who tied Joe Montana for the most post-season wins by a QB of all time, this performance will motivate him to no end come Feb. 5. Let’s chalk this one up to a fluke, an aberration, a one-time thing. There’s still no one Pats fans would rather have. Green-Ellis was a big factor all day despite splitting reps almost completely evenly with Danny Woodhead. It was a vintage, head down, straight ahead running kind of day for the Law Firm, who pounded his way to 68 yards and a TD on 15 carries. On one play, he got his helmet completely twisted around and ripped off, forcing him to go to the ground coconut unprotected, yet another display of the team’s overall toughness Most of the Pats success running the ball came on draws out of the shotgun with the Ravens D spread out and expecting the pass; the more traditional stuff was swallowed up with relative ease. But Benny did his part and then some. Woodhead was quiet save for once nice draw and Aaron Hernandez failed to replicate his monstrous efforts out of the backfield from the Divisional round win over Denver. And our binky Stevan Ridley sat this one out after fumbles in consecutive games, though given the Pats opponent in the Super Bowl, the New York Giants, he will likely be needed. The Giants have a ferocious pass rush and the Pats would be wise to run the ball a healthy amount in order to help neutralize it. On Sunday, Benny looked like he’ll be up to that challenge. This one was mostly the Wes Welker show again, with Deion Branch making two catches for 18 yards and everyone else doing mostly nothing (Julian Edelman caught one pass for eight yards). Welker had a couple of missteps (one drop, one slip, one deflection that turned into a pick that was luckily wiped out by a penalty) but was still his usual, dependable self. He finished with six catches for 53 yards, got the snot beaten out of him once again and naturally, a couple of his grabs resulted in enormously important first downs. At this point, as has been the case for several weeks now, Welker pretty much is the receiving corps. Any time Branch can put up an effort like last week against the Broncos (three catches, 85 yards, that amazing, 61-yard TD), it’s a bonus. This is Welker’s group. Everyone else (except Chad Ochocinco who may as well get cut before the Super Bowl if for no other reason than that he’ll be a distraction on Media Day getting asked over and over again why he is so awful, he doesn’t even dress for the biggest game of the year) is just renting. Not quite the usual game-breaking day for A-Herb or Rob Gronkowski but solid nonetheless. Once again, the focal point of the Pats offense, they combined for 12 catches and 153 yards, though neither of them found the end zone. Gronk, who suffered a rough looking ankle injury late in the game but returned after missing just nine snaps, was immense in other areas than just catching the ball as he often is, at one point absolutely destroying Ravens pass rushing demon Terrell Suggs while staying home to block. And his first play back after leaving because of that ankle? He’s throwing a key block on Brady’s TD leap. These two guys are monsters, as we all know. But now that we’ve reached the final game, the biggest game, maybe we should look at them in the bigger picture. The bottom line is, in an amazing, exhilarating season filled with major moments and major performances, Rob Gronkowski and Aaron Hernandez have become the most important cogs in the Pats offensive machine whose names are not Tom Brady. And they’re both just in their second year. Unbelievable. Have to hand it to Matt Light; in what is probably the best season of his career, he just keeps getting better and better. Every week, it seems, there’s some stud, maniac pass rusher on his side and every week, that stud, maniac pass rusher is rendered an afterthought. On Sunday, it was Suggs, who had 14 sacks during the regular season and has garnered some sincere talk about being named Defensive Player of the Year. Against Light, he had two tackles. Period. That’s two. No sacks. Maybe once, he got within a yard and a half of Brady. And that’s it. The O-line is the core of this team and on Sunday, it stepped up and then some. And not just Light, either. Brian Waters, the best free agent signing this team has made in quite some time, was tasked with bottling up Ravens nose man Haloti Ngata and did just that. Logan Mankins once again shook off his late season knee injury to play a complete, spotless game. Nate Solder had the only blemish, getting beaten to the outside and allowing Baltimore’s only sack to someone named Paul Kruger, not exactly one of the Ravens big names on D. It was a fantastic performance and one that will certainly need to be duplicated in the Super Bowl against the Giants pass rush. The O-line’s inability to handle that same front four in Super Bowl XLII was one of the biggest reasons the Pats lost that game. If Sunday against the Ravens similarly fearsome D is any indication, this time around, this group will be ready. Anyone out there own a Vince Wilfork jersey? Cause I’ll buy it off you. That’s how valuable that thing has to be after Sunday. Wilfork, one of the best, most important Pats of the past decade, played the game of his life against the Ravens, making plays against the run and the pass, wreaking havoc and at one crucial point late in the fourth quarter, single-handedly taking over. On the Ravens second to last possession of the night, with a third-and-3 from his team’s 30, he blasted through the line to wrap up Baltimore’s star back Ray Rice with one arm, dragging him to the turf with one arm for a three-yard loss (a massive stupid play call by the Ravens by the way, but that’s another conversation). The Ravens then decided to go for it rather than try a 50-yard field goal (a decision that obviously makes a hell of a lot of sense now), so Big Vince simply steamrolled center Matt Birk right into Flacco’s grill, taking the QB to his knees while still carrying the giant O-lineman, forcing Flacco to lob the ball to no one and turn the ball over on downs. It was the most dominant sequence any Pats defensive player has displayed in ages when you factor in the situation and circumstances. And it’s fitting that Wilfork, one of the longest tenured, core members of the organization, was responsible for it. And that’s not even getting into some of the stuff he did earlier in the game, which he ended with the following stat line: six tackles, three for a loss, one sack, and another hit on the QB. And he did it all while missing just three of 73 snaps. Outstanding. Everyone else up front played well too; Mark Anderson got pressure on Flacco a fair amount of times and played the run well. Brandon Deaderick plugged up space and both Gerard Warren and Kyle Love played roles in holding Rice, who came in leading the league in total yards from scrimmage, to just 67 yards on 22 carries and only one catch for 11 yards. When this group plays this well and is able to physically overmatch its opponent, it takes so much pressure off of the secondary and makes life easier for everyone. It’s hard to imagine them doing that any better than they did on Sunday. Good for Brandon Spikes. He’s still working his way back from that knee injury suffered against the Giants the last time they played the Pats, but man are his fresh legs a wonder. He made nine tackles on Sunday, a huge part of the defense slowing down the Rice and the Ravens rushing attack. But his finest moment, as well as what was for about three minutes the play of the game, came on a passing play. Spikes intercepted a fourth quarter Flacco pass by simply staying in his land, trailing the tight end as underneath help for the safety and making an awesomely athletic play, extending one of his big paws just enough to snag the darted throw and reel it in. It was a sensational interception; not only did it come out of almost nowhere and was it such a cool display of athleticism, but the timing was perfect. It’s great to see Spikes make plays like that when he gets to stay on the field in passing situations. He’s getting closer to becoming an all-around backer. If he can stay healthy and out of trouble, watch out. Jerod Mayo was solid, not great and that seems to be his M.O., which is OK. He made a couple of big hits and looked very impactful at times yet was doing the chasing, flailing thing a couple times too. It was a mostly typical day for him. And Rob Ninkovich continued to be the second coming of Mike Vrabel; he got to Flacco once (along with James Ihedigbo) and was great against the run, combining with Anderson to do good work taking away the edges. And Dane Fletcher was active and aggressive in limited time. The Pats defense is healthy and coming together at the most opportune time possible. The linebacking corps is no exception. Go ahead, try to start an argument on this one. If you think that more attention should be paid to Flacco playing one of the best games of his career (22-of-36, 306 yards, two TDs, 95.4 passer rating) and torching the secondary down the stretch than to Sterling Moore’s two season-saving plays, more power to you. Because if Moore hadn’t knocked away a sure TD pass to Lee Evans on Baltimore’s second to last defensive play of the day (a play on which Evans was completely complicit) or broken up what would have been a first down throw to tight end Dennis Pitta on the next play, we wouldn’t be having this little chat. Moore was almost as much a hero on this day as Wilfork and more power to him. He’s yet another one of Belichick’s collection of undrafted, unheralded, never-heard-of DBs who rose above the rest of them to become one of the biggest reasons this team is going to the Super Bowl. Gotta love it. Things were OK elsewhere despite the yardage totals and the Ravens success on third down (nine of their last 14); Patrick Chung wore the goat horns on a 42-yard pass play to Ravens deep threat Torrey Smith. Kyle Arrington missed a chunk of time with an eye injury, but was pretty good. Devin McCourty saw more time at safety and also could share some blame on that throw to Smith (as well as a 29-yard catch and run for a TD also by Smith) but managed to make it through another week without humiliating himself. Ihedigbo had that sack with Ninkovich on a nifty, delayed blitz and added eight tackles including one for a loss. And Edelman got matched up with the Ravens best receiver Anquan Boldin, and was burned more than once but completely lucked out that Baltimore’s offensive coaches were too stupid recognize the matchup until the final five minutes. It’s going to be interesting to see how this group deals with the Giants receivers, two of whom (Hakeem Nicks and Victor Cruz) are absolute studs (and for the purposes of this discussion, let’s say interesting means terrifying). But we’ll worry about that next week. For now, let’s continue to celebrate Moore. What a couple of huge, huge plays. Hallelujah. Yikes. In what could have been a disaster, Woodhead fumbled a kick return at his own 30 following a long Ravens TD drive that gave them their first lead of the game. Luckily for him, the Pats defense came up with one of its best, stiffest stops of the evening afterward, keeping the Ravens from a first down and forcing them into a field goal that made the game 20-16, setting the stage for the Pats to reclaim the lead on their next possession. There was Woody again on the ensuing kick, running another one back, which was a big surprise, especially seeing as how Ridley had been banished for his fumble-itis and neither of those were half as costly. Anyway, it was a huge bullet dodged. The Pats have been pretty much nowhere in their return game all year but have gotten away with it. You have to wonder if Woody will be back there again next Sunday in Indy. As for the kicking game, Stephen Gostkowski was 3-for-3 on field goals and only had one kickoff returned all day and our man Zoltan blasted two punts for an average of just under 50 yards per. Job well done. Maybe this grade should be a bit lower. Some of the play calling, particularly down the stretch, was questionable and that’s being friendly. The bomb to Slater made little sense at the time, even less so when it was picked off. And when the Pats got the ball back following the Ravens failed, fourth down conversion attempt, they went three-and-out with a chance to salt the game away, with a couple of real head-scratchers (a toss play to Benny on 2nd and 4?) included. But in the end, this grade is a testament to how ready Belichick had this defense ready to play. The Pats were on their heels on defense all year but allowed just 30 points in two playoff games and had guys making plays everywhere both weeks. There may not have been too many name guys out there, especially in the secondary, but they were Belichick’s guys, tough guys, guys who took his coaching and got better every single week. 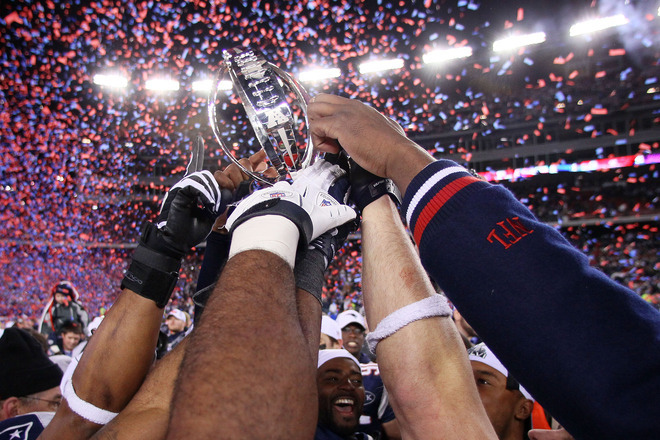 And now, the Pats have won 10 straight games and are going back to the Super Bowl. It’s pretty unreal. We could harp some more on the play-calling. Or we could do a comparison with the coaching on the Ravens sideline (so so poor in the fourth quarter in so many ways that it warrants its own 3,000 word column). But why bother? This season was arguably the best job of Belichick’s career. Let’s just leave it at that. Ocho didn’t play in the game because his father passed away. You didn’t get to the biggest gag job you ever saw. According to reports, he was back in time for the start of the game. Just didn’t get activated. I haven’t yet watched the game on TV, but certainly we the crowd were into it. I don’t think we sat down the entire game. But really, did the Ravens do something that got Brady skittish? And, more importantly, is it something the Giants can replicate? The old recipe of “get enough pressure with just 4 to cover everyone”? The other I saw while there was the absolute mugging that Wes Welker gets, esp. when the ball doesn’t come his way. I think the refs are afraid to make a call away from the ball in the post season, and it really hurts us. Several plays I would see Welker get completely wrapped up a good 10 yds downfield. Reminds me of the 2001 Pats and what they did to the Rams receivers, only getting called the once on McGinnest. That has me worried. Danny Woodhead is learning the kick-off return role and is a work in progress. One fumble in that capacity does not a failure make. Danny will learn from it and make the needed adjustment. It is obvious that the coaching staff has great confidence in Woody in that they put him right back in the same position for a nifty and sizeable return. That speaks highly of Danny’s abilities to run the ball back in the maze of 11 defenders whose sole purpose is to destroy you. Even the fumble return was a significant gain before the ball was pulled out of his grip. Danny is improving in that role game by game, so quit the rush to judgment Jeremy and loosen up……Jeremy, you did not speak postively of Danny as a running back either. How could you when Obrien stupidly keeps running Danny up the gut all year long- i.e. 6 times against the Ravens. Danny is not an up-the-gut buster or Law Firm clone as Obrien seems to think and tries to make him. Danny is a lethal perimeter runner and short pass receiver, and has been used in neither of his gifted capacities since the playoff loss to the Jets last year when Obrien dumbly ran him up the middle ad nauseum. It didn’t work and the Pats lost. The 928 yard, 6 touchdown Danny Woodhead of 2010-11 has all but disappeared in 2011-12 because Obrien gut busts him and seldom if ever has Brady making passes to him……Jeremy, what you should be asking yourself is how can it be that the lethal replacement for Kevin Faulk last year could be reduced to such sub-parness and non-lethality this year. The answer is Bill Obrien,and the tragic wasting and misuse of Dannhy Woiodhead will not stop until Obrien is finally in Happy Valley. Agreed. The crowd was great. I remember sitting down at halftime, and my buddy and I were talking about how it was the first time we sat down since we walked in. I watched the TV copy last night and it looked to me like Brady was just a bit off. I didn’t see him feeling paranoid about the rush, like we’ve seen a handful of times over the years. There were throws like the one to a wide-open Gronk, the one he led Hernandez too much down the seam and the one behind Welker that was picked. The throw seemed rushed because he felt he need to thread the needle, more than he was concerned about getting hit. The one to Gronk in particular he had no rush and seemed more shocked that Reed bit on the fake, that he rushed it too much. This season is playing out exactly like the 2006 Colts season. The Colts ran up their usual 12-4 record, but nobody took them seriously all year because of their defense. But then the playoffs came around and the defense began making more plays than the offense. People are getting on Brady for his statistically bad game vs. Baltimore, but miss the fact that he made huge, game winning plays. Manning had the same criticism in 2006 and actually had his worst postseason of his career (if you go by numbers). Seriously, look at the scores of their 4 playoff games. Not Manning/Colts-like at all. Again, Manning made “winning” plays when he had to that year. I believe it’s playing out the same way for the Patriots, with the much maligned defense STILL getting no respect. With the opponent supposedly having a “ferocious” and “unstoppable” defense (Bears in 2006, Giants now). Mark my words, the Pats D will end up making more plays in the Super Bowl and the MVP will come from the Defense.